If you hear a loud, nasal "yank-yank-yank" call, it is likely that of a nuthatch. 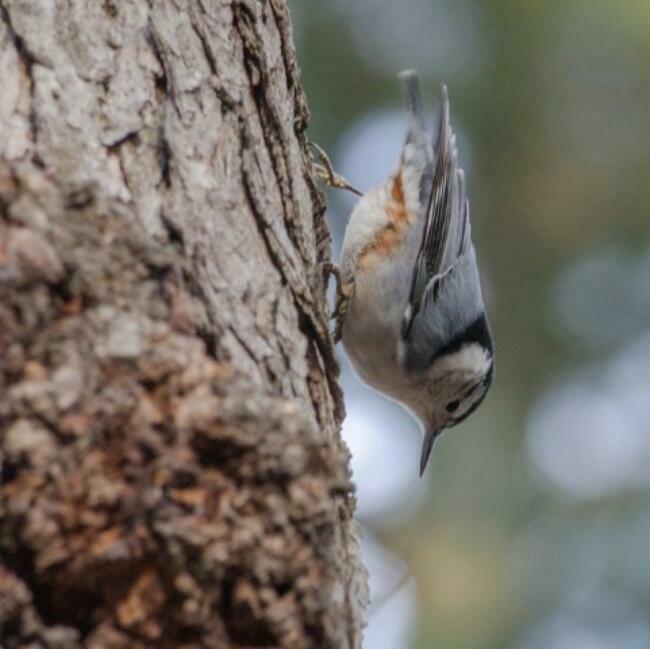 In High Park, we can find both Red-breasted (smaller) and White-breasted (larger) nuthatches throughout the year. Both species become much more noticeable in late fall through winter when banded together in mixed-flocks with woodpeckers and chickadees, loudly touring the local bird-feeder scene.During the warmer months, nuthatches hunt insects such as beetles, caterpillars and ants. With fewer insects to find in the cold, they switch their diet to mostly seeds. Nuthatches have the peculiar ability to go down a tree trunk head-first, which could be a helpful angle to spy sustaining seeds they stashed in bark crevices earlier in the year. White-breasted Nuthatch. Photo by Andrew Yee.